"Right from the beginning Rebecca seemed to know exactly what we wanted and has given us a kitchen that we love. Great interaction with our builders meant that minor issues where ironed out quickly and efficiently. From beginning to end, design to fitting, everything was carried out with great professionalism." 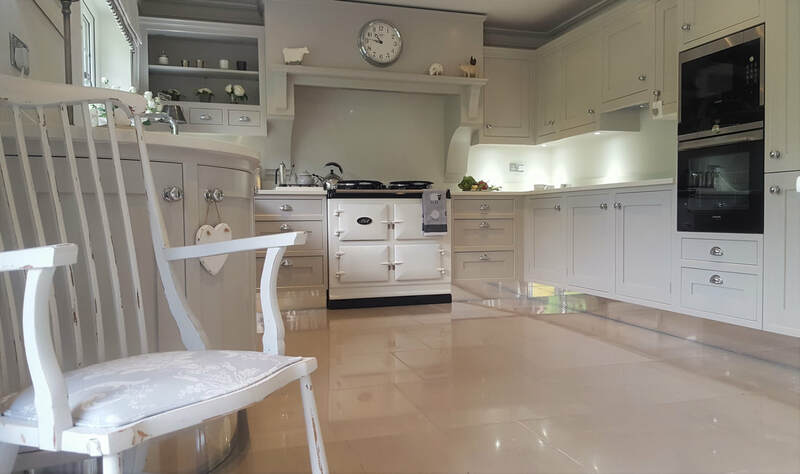 “We were delighted with the design consultancy and quality of work from Maxine at Farnham Furnishers. Their kitchen was the final ingredient of a long-term renovation project and it is now the best feature of our house. Every stage of the process through to installation was extremely well managed and thoughtful. Would heartily recommend. 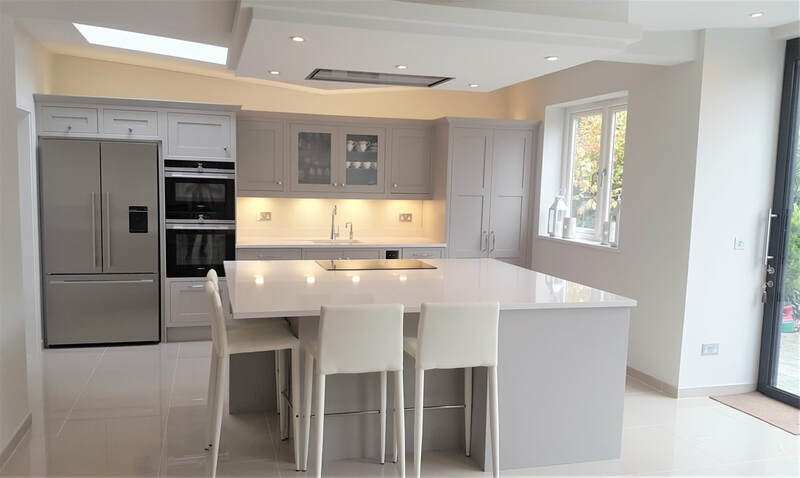 “ We chose Farnham Furnishers to design, supply and install a kitchen as part of a ground floor extension project. As the kitchen was one of the main rooms in the extension, it was important to get it right. 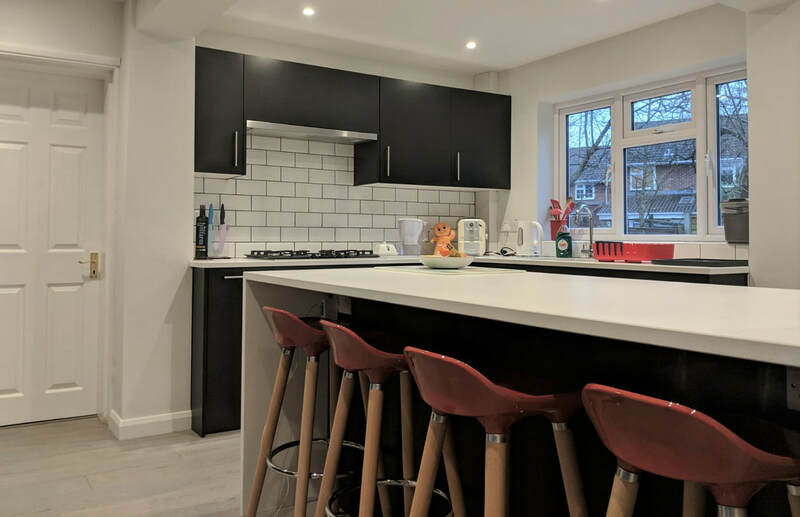 We are very happy with the end result and love spending time in our new kitchen, which is a great space for cooking, everyday living and entertaining. We found the design process to be a personalized and collaborative service, they have lots of experience and suggestions but also took our ideas on board to ensure the design met our needs. They were also flexible in changing the design when unexpected issues arose. 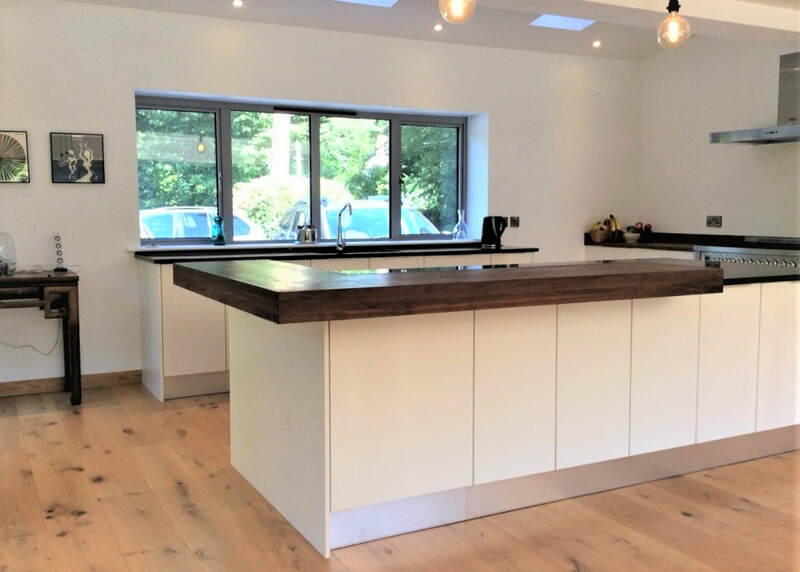 Rebecca provided detailed design drawings which removed much of the stress of communicating our requirements to the builders where there were interfaces between the extension and the kitchen. Installation of the units and worktops went smoothly. Farnham Furnishers are always contactable which provides reassurance that any issues will be dealt with. " 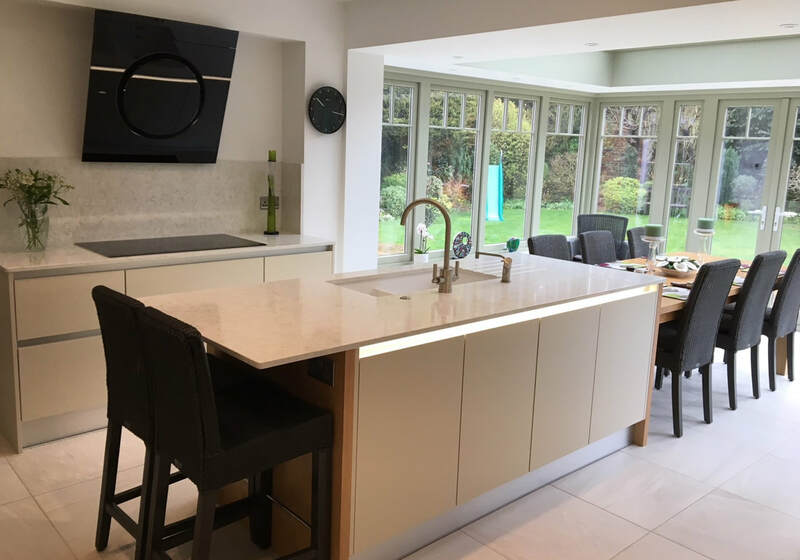 “ We're delighted with every aspect of our kitchen and we found working with Rebecca at Farnham Furnishers such a pleasure. You were extremely patient and helpful both when we were trying to decide exactly what we wanted and with our builders when they didn't manage to stick to schedules or timescales. A very sincere thank you for making the kitchen such a stress-free part of our house project. 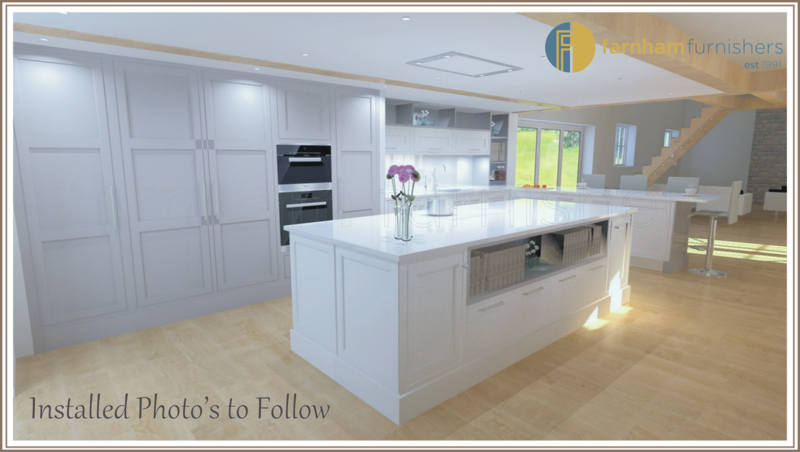 The design and layout of the kitchen are great and really work for us and for the house. Your fitter (Russ), was also excellent. He took such care over his work and was a pleasure to have in the house. We would recommend you to others without hesitation.
" Farnham Furnishers were the only company to come up with a different concept to make the available space work. Please take a good look at the web site and then visit the newly refurbished showroom and engage with one of the designers. Remember they want to help you come up with that WOW kitchen. 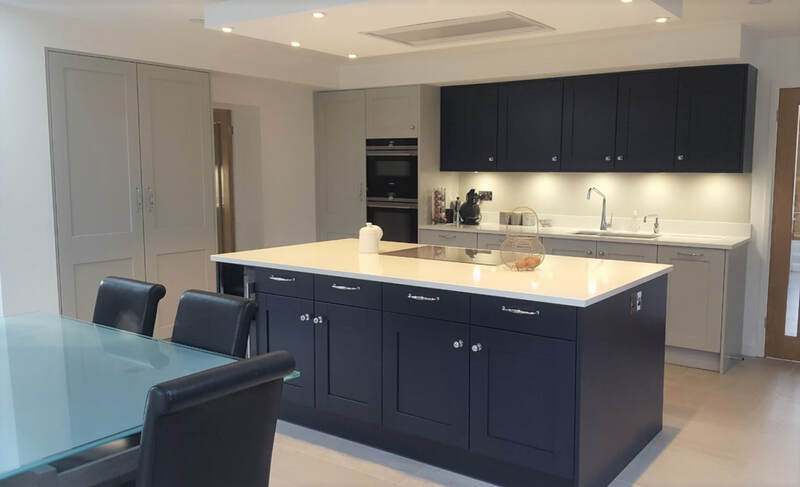 Overall I am really impressed with the design concept, the quality of the products recommended and the superb attention to detail delivered by the fitters. " 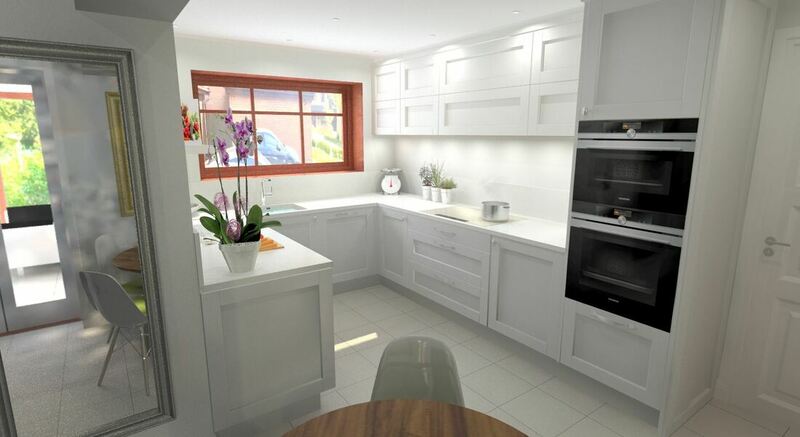 " Thank-you so much Maxine for designing our kitchen. We love it and really appreciate the thought that went into it. Lots of things we would never have thought of helped to make it our dream Kitchen. Also thanks for the management team who coordinated our kitchen installation so brilliantly. What could have been a stressful experience was a lot easier than we expected. " " Marvelous professional company. Beautifully made and finished. Great back up after sale service. I have a lovely kitchen that works well and looks fantastic. From installation to finish everything went along smoothly and efficiently. Well done Farnham Furnishers. " " ​We absolutely love our new kitchen. We spent a while choosing the design before approaching Farnham Furnishers. Rebecca was great in helping us to achieve it. 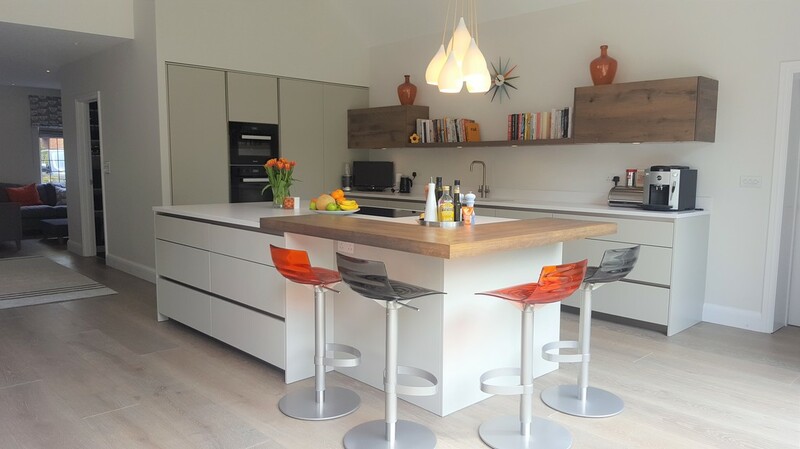 She offered flexibility in product design and finishes to achieve a bespoke kitchen and utility which we are thrilled with. The service was organised and efficient. 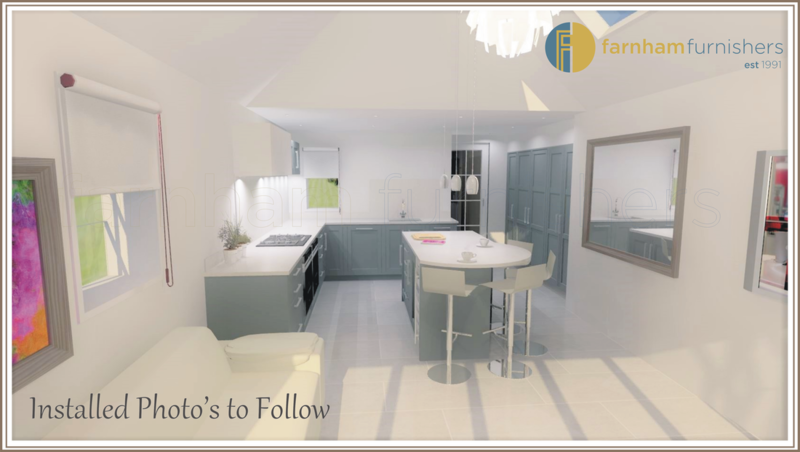 We were provided with plenty of images and plans of our kitchen and utility. Whenever I had a query, they were very quick to respond and come up with solutions. There were no hidden costs or extras charges upon completion. Would highly recommend. " 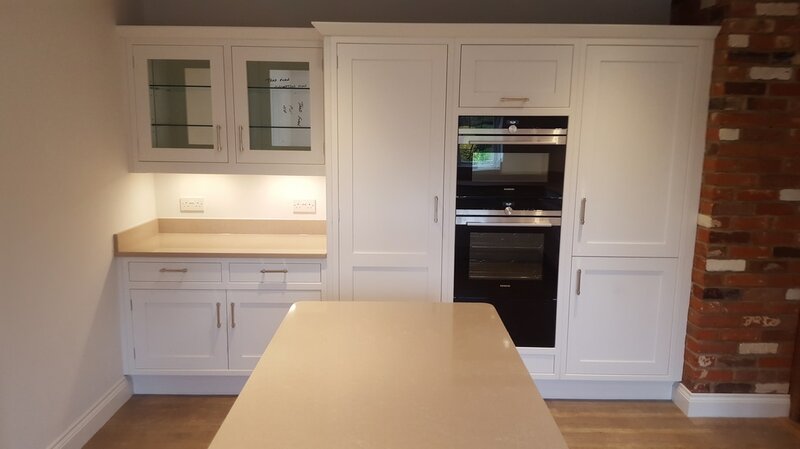 " I cannot rate Farnham Furnishers enough when it came to the design, build and installation of our new kitchen/utility. Our designer managed the project to the highest level of professionalism, was attentive to our requirements with a wonderful hand held approach to the process from start to finish. Rebecca was also able to work competently with the builders, plumbers and electricians due to her background knowledge which believe me, was invaluable. Personally, I wouldn't even contemplate looking at other kitchen companies. You will not find better quality or value for money anywhere else. " 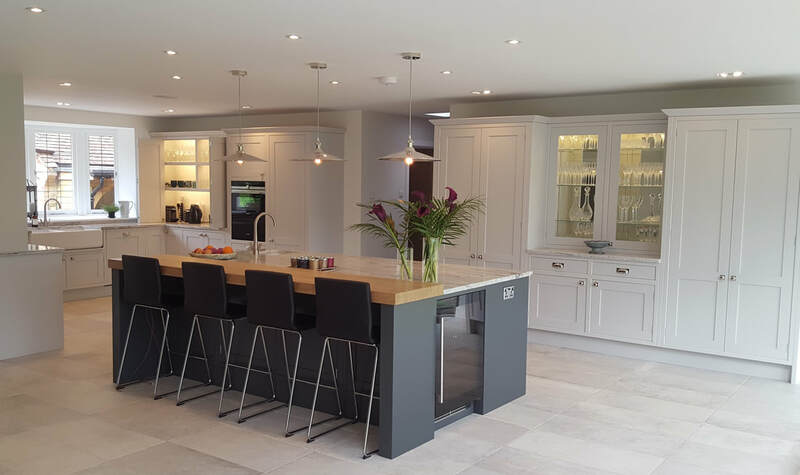 " Have just had a Warendorf kitchen designed and fitted by Farnham Furnishers - absolutely thrilled with the result. 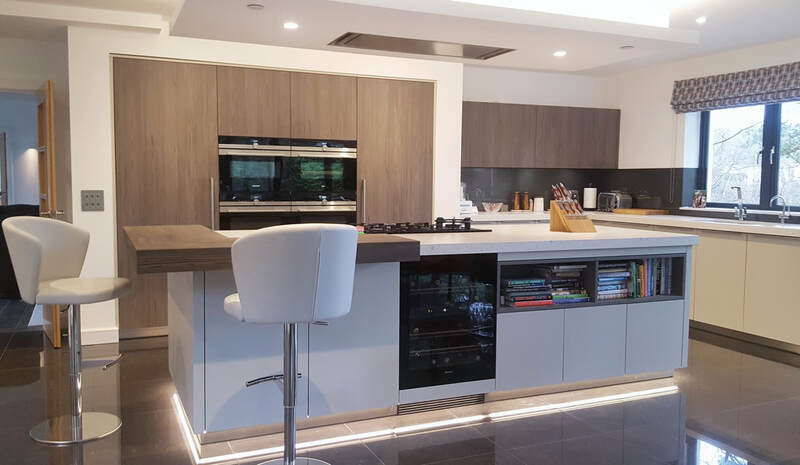 The service has been great from start to finish - working together with Rebecca to get the design just right, liaising with our builder on a regular basis, and generally being there to give advice and reassurance on both the cabinetry and the appliances. Finally, praise for the fitter (Russ) who came and fitted our wonderful kitchen over a period of about 3 weeks. Definitely recommended. " 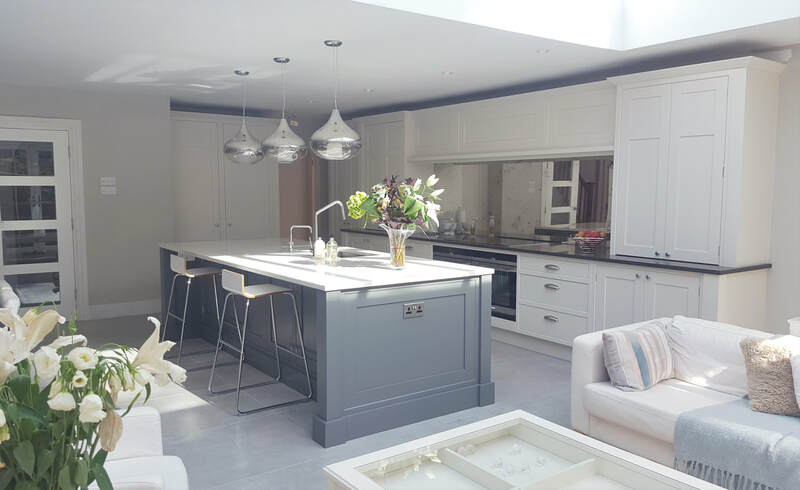 " ​We are absolutely delighted with our kitchen designed by Farnham Furnishers. Rebecca was always so patient, helpful and enthusiastic, and her attention to detail was exemplary. The project ran smoothly and the other members of the team were also very professional and a pleasure to work with. " Pop around anytime to see us - i'll have the kettle on.